Yesterday I attended Dr Ruben Puentedura's ISTE presentation about how to bring SAMR together with TPACK. I've used the SAMR model for many years (in fact my posts about using the SAMR model are the most popular ones on this blog), and more recently have considered the different types of knowledge contained in TPACK. It was really great to see how these two models come together to support technology integration that can transform student learning. I was really interested to hear that Dr Puentedura stated that PCK (pedagogical content knowledge) is the most crucial of all the TPACK knowledges for any process that involves change/transformation of teaching practice. 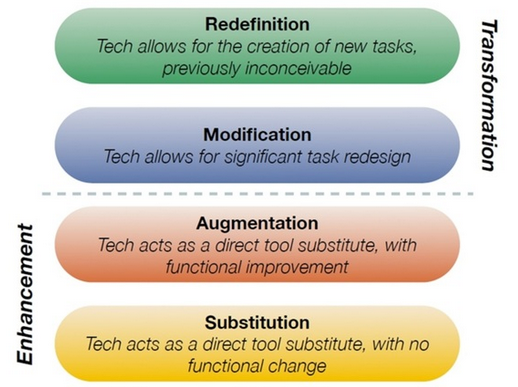 Thinking about how this relates to the various stages of the SAMR model, Dr Puentedura said that to integrate technology at the Substitution level you need very little of the TPACK intersections though teachers might need to develop some technology knowledge. One example he gave is students using online maps. 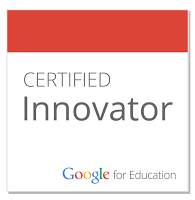 At Augmentation level we want students to get to deeper level of understanding. It's important to offer PD at the individual knowledge areas of technology, pedagogy and content but again not much is happening at the intersections of these knowledges. The example he gave was one of building an interactive map. This is definitely augmentation as it is something that couldn't be done with a paper map. At the Modification level of SAMR we now start to see a change and the intersections of the knowledges become important. Teachers will need support at the PCK, TCK and TPK areas as different types of knowledge is needed to redesign tasks at this M level. Dr Puentedura talked about the need to develop a community of practice at your school - as knowledge at the intersections is most effectively conveyed from one teacher to another, and not by an outside expert. Once again, taking the mapping example he described how modern databases can be displayed on maps to visualize concepts. At this level we are supporting exploratory work by students. Once we move to the Redefinition stage of the SAMR model we are calling on all three knowledge areas in order to redefine the task. Once again Dr Puentedura talked about how a community of practice is essential at the redefinition level. In addition students need to assess the results of what they did and to communicate this to an audience outside of their class. I was interested to follow the discussion that followed that of taking a single subject (mapping) and taking it through all the levels of the SAMR Model. Dr Puentedura showed how we can use SAMR for a set of resources or practices (e.g. note taking). He based this on an article that has been doing the rounds lately about how the pen is mightier than the keyboard when it comes to note taking (for example here is a version of the article that appeared in the Independent). Dr Puentedura argued that there is nothing wrong with the research, but the problem is with the reporting. Here is how he sees the SAMR model being applied to note taking. Substitution - students are doing all the writing of the notes themselves. However notes given to students by teachers can be just as good as those they write themselves as long as students get to annotate and fill in (actually the results of this can be better than simply writing notes). Note taking should not be just passive transcription but instead used as a framework for the thoughtful annotation of notes. Augmentation - notes don't have to be long series of writing and often it may be better to use a mind map where text is a stream that helps you to recall notes. Online concept maps allow you to add hyperlinks into the maps (notes within notes) and to collapse and expand notes in a way you can't do with paper. In addition you can bring in images, movies etc. At this stage you can also use pen function to write on a computer/tablet. He gave an example of this from a maths lesson, and then showed how you can use this writing with an app to do mathematical calculations after handwriting the formula - and in this way students can bring the formula alive. Modification - the assumption in the articles about handwriting contributing more to learning than keyboarding is that note taking is done alone. Modification of the task allows for collaborative notes and the use of social media e.g. Twitter. Once you start to see notes as being social/collaborative then different things become possible. Students can add into the conversation with extra resources etc. At this level note taking has been significantly transformed. Redefinition - at this stage notes are part of the construction of understanding of the entire class and beyond and can be an important catalyst in getting people to think differently. Every student creates their "notes" using the tools they use best and the notes created are shared - in this way you have the construction of knowledge that shows how people are thinking. These "notes" can be collected together, for example on a Haiku website. The notes have now been repackaged so they are useful to someone else. Please click on the images if you want to see bigger versions of them.